Phone talk on green background. Black man with smartphone. Phone talking on green background. 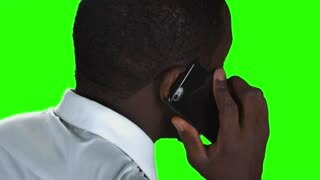 Black man holding cellphone. Phone call on green background. Black man with cellphone talking. Be positive and confident. Well presented man with tablet talks to camera. Green hromakey background for keying. Talking mature man on green screen. Elderly man in casual wear talking to camera on chroma key background.